So in my daily surfing for things, I came upon The Church of Jesus Christ of Latter-day Saints (don't ask). So I see they have a free copy of the Book of Mormon, I proceeded to click... Yeah I wanted a free copy, what I was going to do with it I don't know (I'm Christian Catholic). Thought it was a good idea to see what they believe and have written. 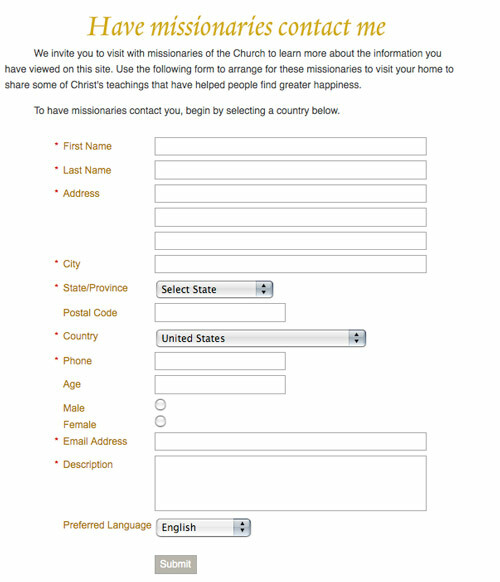 Then I see the bolded line saying "To request missionaries to deliver your free copy and share a message" of course I said HELL NO. Not saying they are evil or bad, but those dudes in those backpacks are very annoying. This is even worse I think. Disclaimer: Not saying Mormon's are bad people at all. I love all religions, but this was too funny to pass up. It was the first thing that popped into my head.